I just happened to pick up an old Macrame bracelet that’s knotted in such a way as to create a flower design so I decided to try and adapt it to work with my sugar skull. It’s a very old and very simple technique and as I began working the first thing that hit me was how much the bead patterns resembled the eyes on the sugar skill…don’t you just love happy accidents…? The bracelet is strung on Irish waxed linen and uses simple glass beads with size 6 Czech picasso beads to form the petals. I wasn’t sure what to use for the clasp but another fortuitous find amongst my stash wad a cute lampwork shank button by Julie Fountain…the colours work well with Jen’s bead and the heart motif is a classic for the day of the dead theme. I wasn’t sure at first but it’s definitely growing on me and it’s really comfortable to wear because the skull has a flat back so sits very nicely. All in all I’m pretty pleased. What a wonderful design! 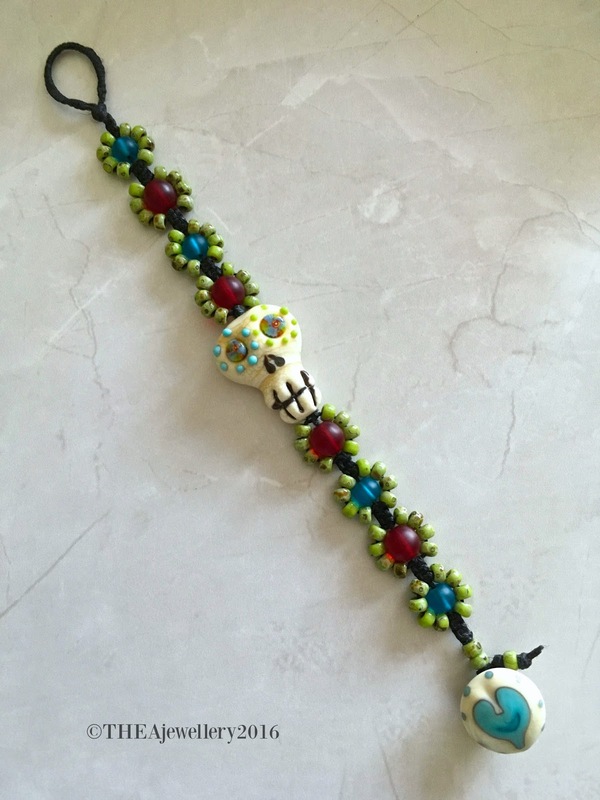 I love the colours you have used and the clasp goes beautifully with the skull! I love that the macrame maintains the rustic nature of the skull so well. I bet this is super comfy to wear too! I love that you made a bracelet!1 This macrame desgin creating flowers really accentuates the sugar skull. Great piece! I was going to say that about the seed bead pattern echoing the eyes… Colors are perfect. Geez – between you and Cooky I am now starting to be intrigued by micro macrame! Who would have thought! Also love that its a bracelet. I get stuck in the necklace rut sometimes. I love it! The design is perfect for it. Oh my gosh! THis is so cute. The color choices you've made are perfect to compliment the sugar skull. I would love to wear this to an upcoming Dia de los Muertos event I'm going to next week. I love that you used macrame, the flower patterns are perfect with the bead, a great way to wear it everyday! I LOVE happy accidents, and it looks like you had a series of them. That flower bead pattern thing you have going on totally mimics the eyes and looks like it was designed specifically for that bead. The colors are amazing and the heart clasp is perfect. It's even a similar wonky shape as the skull's nose. LOL! Thanks for participating in the challenge! A great design full of color and happiness! I was in Texas for two weeks, so I finally get to leave comments. Great bracelet, Lesley! I agree, it's full of happiness!